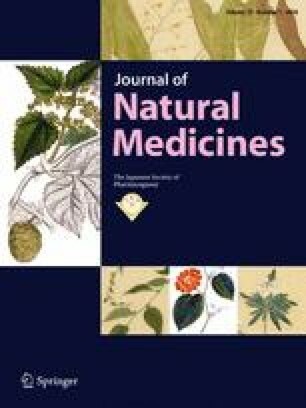 Bioactive constituents from the whole plants of Leontopodium leontopodioides (Wild.) Beauv. Five new compounds, leontoaerialosides A (1), B (2), C (3), D (4), and E (5) were obtained from the 70% EtOH extract of the whole plants of Leontopodium leontopodioides (Wild.) Beauv. Their structures were elucidated by chemical and spectroscopic methods. Moreover, compounds 4 and 5 showed significant effects on stimulating the hepatic glucose uptake in HepG2 cells. This work was financially supported by grants from the National Natural Science Foundation of China (31460081, 21405113), and the Important Drug Development Fund, Ministry of Science and Technology of China (2017ZX09305-002).